COMPANY PROFILE IDBI Bank Ltd is an India-based company that is principally engaged in banking. Its services entail wholesale banking, retail banking, and treasury services, capital market activities and investment banking. IDBI Bank is an India-based company that is principally engaged in banking. The company’s business segments include wholesale banking, retail banking, and treasury services, with wholesale banking and retail banking jointly contributing the majority of total revenue. In addition to its banking business, the company is also involved in capital market, investment banking, and mutual fund businesses. The company operates through a branch network across India. Its operations are concentrated in India, with a presence in overseas markets as well. 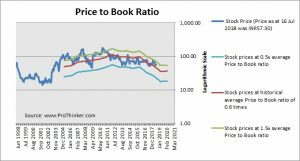 At the price of INR57.30 as at 16 Jul 2018, Idbi Bank Ltd is trading at a Price to Book Ratio of 0.7 times current book value. 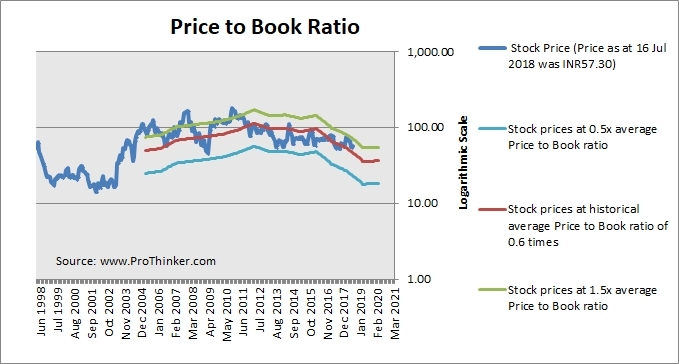 This is a 21% premium to its historical average Price to Book Ratio of 0.6 times.